The Antonin Guyon estate, one of the most prestigious in Burgundy, spreading amongst the most renown vintages of the Côte d'Or,is owned by the Guyon family, in the wine trade since many generations. The two brothers, Michel and Dominique, watch over the destinies of this huge estate of 11 9 acres. A model of a family. The vineyard is impeccably kept, with complete ploughing, moderate improvement of the soil with the sole use of manure. The harvest is also given much attention. The picking of the grapes is made with delicacy, in 40 kg caskets. Within 30 minutes, the grapes are sorted out in the vineyard and a second time in the cellars, the raw material nearing perfection. The harvesters are regular helpers and familiar with the vineyard, some coming now for 25 years. 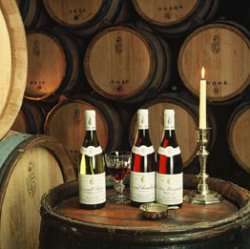 The Domaine Guyon offers an exceptional range, mostly in the Premiers Crus and the Grands Crus, from Gevrey-Chambertin and Chambolle-Musigny, from Aloxe-Corton up to Savigny-lès-Beaune, Beaune, Volnay and Meursault.